E-linking one component epoxies offer easy application, increase productivity and eliminate waste.Specially formulated one component epoxy systems feature outstanding performance properties, long-term durability and easy application. These no mix compounds cure quickly at moderate temperatures. They are designed to increase productivity and eliminate waste. As with all products in the E-linking family, specific grades vary in viscosity, cure speed, chemical resistance and electrical properties, but can be custom formulated to meet your application needs. 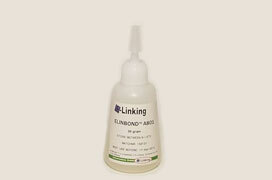 ELINBOND E103 ELINBOND E103 is a one component, thixotropic epoxy adhesive. It combines flexibility at temperatures down to -30°C with high peel and tensil e shear strength over a broad temperature range. ELINBOND E103 forms strong bonds to copper, aluminum, fiberglass reinforced plastics and oily steel. 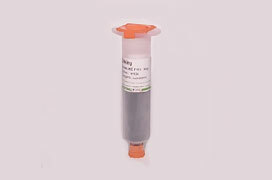 ‍ELINDUCT E323 Ultra High thermal Conductivity, Die Attach Adhesive. Thixotropic, Excellent Dispensability; High strength, High reliability; High thermal conductivity, Provides a conductive heat path. ELINDUCT E313-2‍‍‍‍‍‍‍‍ Electrically Conductive Bonding Adhesive.Thixotropic, Low flow during cure; low volume resistivity, Excellent electrical conductivity; Fast curing, High output. ELINBOND E325‍‍‍ Rapid curing, one part epoxy. Meets USP Class VI biocompatibility standards.